Following the first round, the Premier League standings are conditional. Nevertheless, it is significant that Shakhtar and Dynamo earned 3 points in their opening matches. The Ukrainian top football sides will start to vie for the gold, with the upcoming head-to-head meeting being one of the key ones for the rivals this season. On July 20, the Miners conducted an open training session, where Paulo Fonseca, Darijo Srna and Sergii Kryvtsov answered journalists’ questions. After serving a one-match ban, Taras Stepanenko is ready to help the Orange-and-Blacks again. At the same time, the 2nd round top match will be definitely missed by the injured Maksym Malyshev and Ivan Ordets, who picked up an injury in the fixture against Vorskla, and trains individually. After suffering a loss in the clash for the Super Cup Oleksandr Khatskevych’s Dynamo emerged victorious at Chornomorets (2-1). The Kyiv side were the first to concede a goal, but they turned events around before going into the break, courtesy of goals from Volodymyr Shepelev and Andrii Yarmolenko. At the post-match press conference, the white-and-blues head coach reminded that he could not count on the disqualified Junior Moraes in the domestic league and stressed that Diemersi Mbokani’s performance, who returned from Hull City, looks most convincing of all the attackers. We add that on July 20, the club announced Dmytro Hlebas going on loan to Dynamo Minsk. In the Ukrainian Premier League, the opponents met 53 times. Shakhtar have 19 wins under their belt, as Dynamo claimed 20, with 14 more games ending in a draw. The total goal difference: 70-66 in favour of the Kyiv side. 26 fixtures took place on the Miners’ field: + 11 = 9-6. The goal difference is 36-27 in favour of the Donetsk team. Shakhtar played the 31st round match in the status of early champions. Paulo Fonseca’s men quickly responded to a middle-of-the-first-half goal from Garmash, as Alan Patrick blazed a well-placed long-distance kick home to make it 1-1. 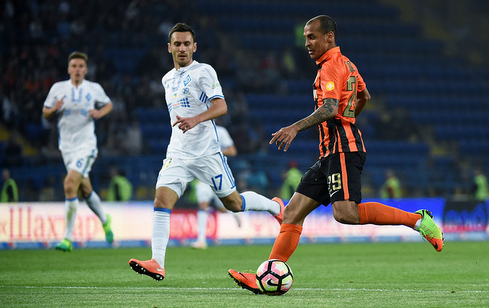 In the second half, the Orange-and-Blacks had to recover from behind again, after Yarmolenko realized a penalty, with Dentinho managing to do the needful by making his mark on the scoresheet within six minutes. Yarmolenko registered the last goal in the 71st minute. In the late stages, the opportunities came Ferreyra’s and Tankovskyi’s way, with Dynamo goalie Koval making a save in both episodes. Sergii Kryvtsov can make his 100th app for Shakhtar. The Donetsk players’ goal-scoring streak in the Premier League started on August 28, 2015 involving 53 matches (135 goals).